Why is a Laser Faster than the Classic Moth - Or Is It? 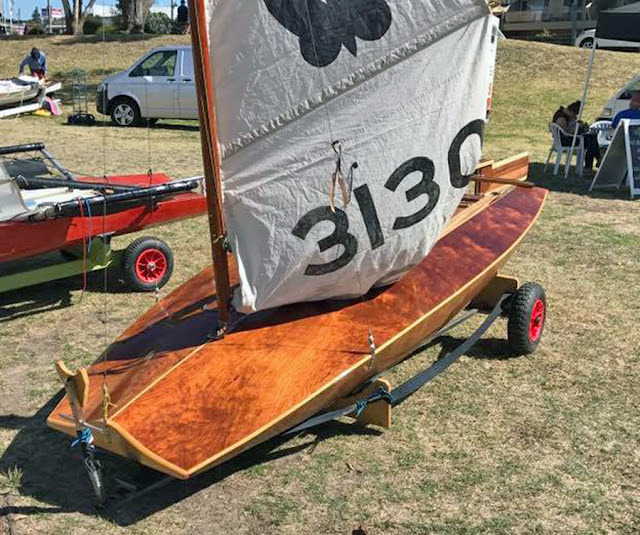 "I've spent a lot of time ogling classic moth designs, from the Gen II mistrals to the Gen I Mint, and I'm a bit smitten by the Farr 3.7 and the Contender (very different boats, I know). So I'm curious: among all the shapes swirling around in my head, some of them reportedly are much faster than others. And the moths in particular *look* fast but aren't nearly as fast as a laser, which nevertheless "sails like an aircraft carrier" in comparison. "So my question: how do I evaluate a hull shape? What characteristics are associated with downwind vs. upwind performance, and what equates to overall speed? And why is a laser faster than a moth? Is it the sail? Is it the length? Is it the shape? What happens to a laser when you cut it down and put a moth sail on it (maser)? Does it slooooooow down? 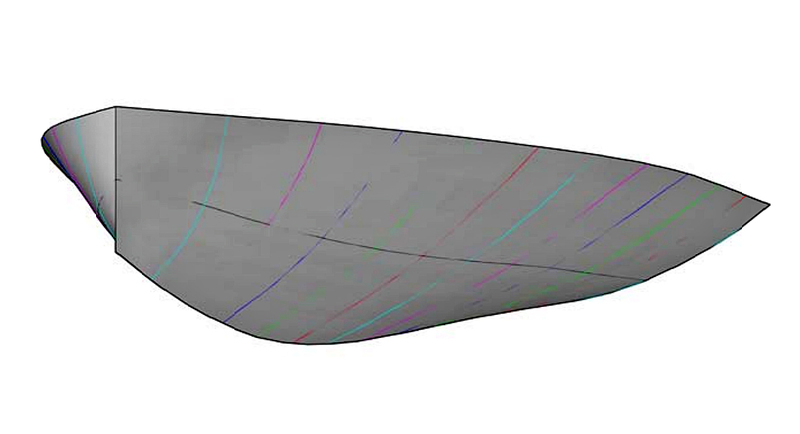 I think the crux of "cmjns" question deals with hull shape and, specifically, why the flat Laser shape is so different from our fastest Classic Moth hull shape, the Mistral or Duflos designs which have low wetted area, narrow waterline beam, rocker forward, with a large amount of flare to the gunwhale. Does that mean the flat Laser shape is inherently "faster". 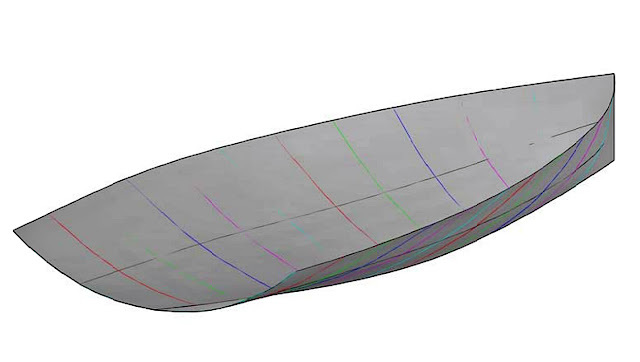 Are the fastest Classic Moth hull shapes an anomaly? For a comparison is the following four views of the Mistral hull shape as modeled by Andrew Slavinskas. Not a flat area to be found. 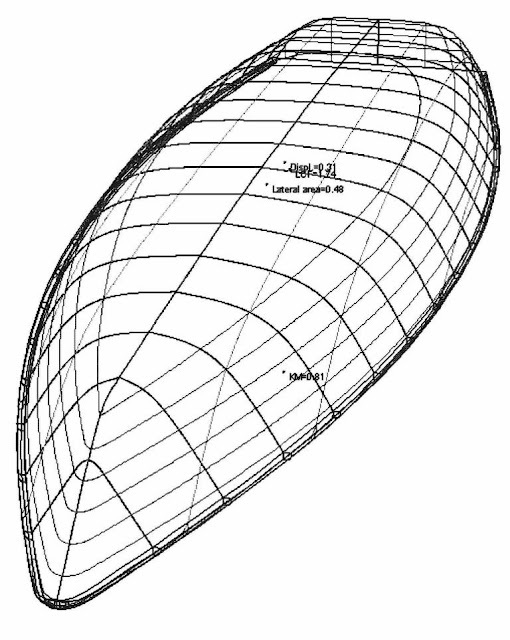 The transom is a very circular shape. The downside to this hull shape. As with our Mistral design, the RS300 is very tippy and has a tendency to trip up her skipper with regularity. The RS300 is worse than our Gen II Classic Moths in that respect because the RS300's modern rig is much more powerful than our vintage low-aspect rig. 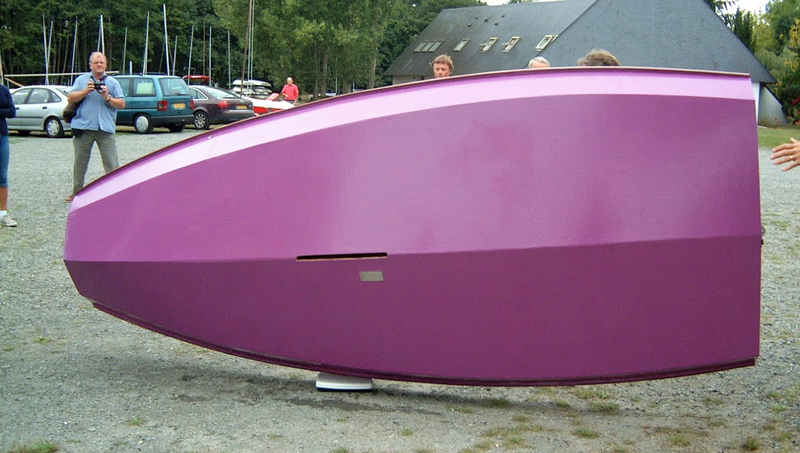 As such the RS300 has carved out a small niche among those singlehanders who want an athletic, challenging, conventional (no-foils) full-on racing dinghy. The market for the RS300 is small enough that RS has given the RS300 production over to another low-volume builder. So our fast shapes in the Gen II Classic Moth fleet are not an anomaly. 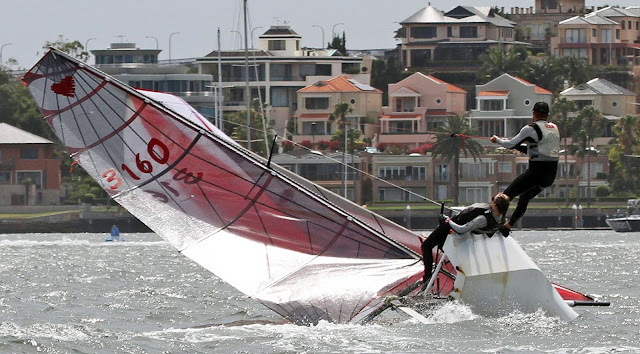 There are exactly the shapes you would design if you want the fastest hiking, non-trapeze, non-sliding seat, non-foiling singlehander. However, if you are trying to sell a lot of dinghies, you just might not find a large enough crowd that would enjoy all that wind-swimming. From the Earwigoagin archives, you can find other RS300 posts. Another old post from the Earwigoagin archives: Why is a Classic Moth better than a Laser? Chestertown Maryland is where our local Classic Moth fleet has home-base. 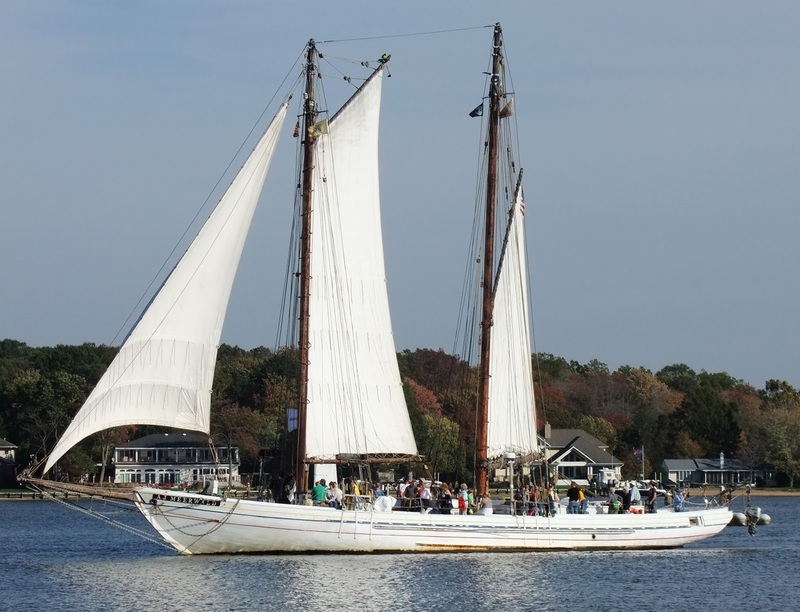 It is also where the assorted tall-ships and traditional schooners of the Mid-Atlantic Region gather on the last weekend in October for a festival called Downrigging Weekend. John Z. was taking his now-surplussed Mistral over to Chestertown that weekend for a demo sail (and possible sale) and I tagged along with my old digital camera to hopefully get some photos of these traditional ships. The Chester River is narrow up near the town so my feeble zoom lens would not be at such a disadvantage in getting reasonable photos. 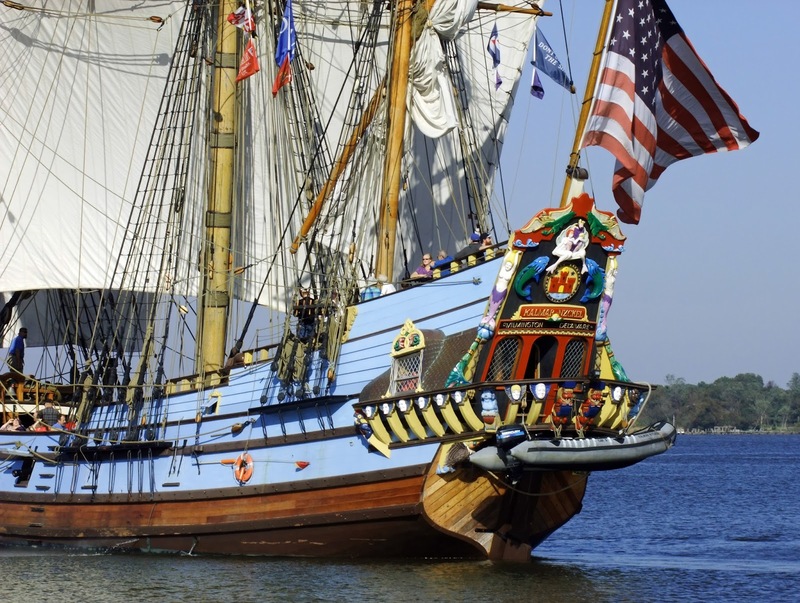 The Kalmar Nyckel is a reproduction of a 17th-century Dutch pinnace based on a design of 1625. 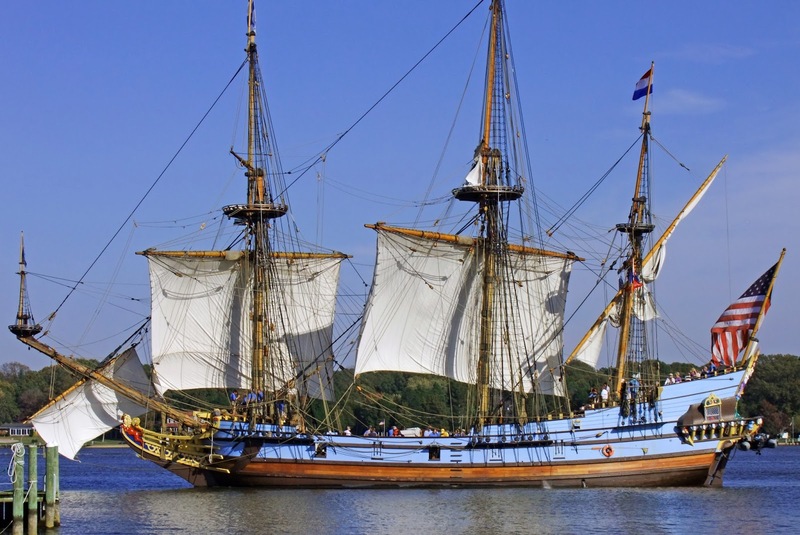 This tall ship, under the command of Peter Minuit and financed by the New Sweden company, brought Swedish immigrants over to settle New Sweden (now the state of Delaware). The Kalmar Nyckel entered Delaware Bay in March of 1638. 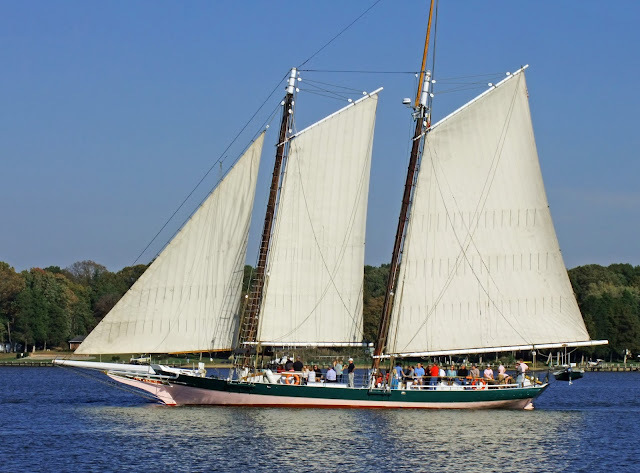 The modern reproduction was launched on the Christina River in 1998 and is the official tall ship of Delaware. When I think of pirate ships, I think of a stern like this (well maybe not the RIB). The Sultana is an 18th century Royal Navy coastal patrol schooner used to collect duties and pursue smugglers. 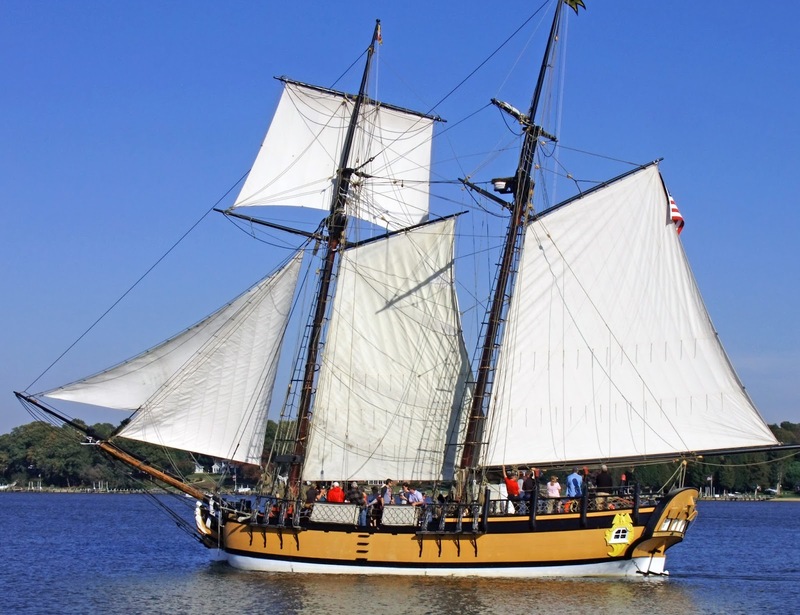 The original was built in Boston in 1767, made its way to England where she was purchased by the Royal Navy and sent back to patrol the East Coast. The reproduction was built in Chestertown in 2001 and is also based out of there. The Pride of Baltimore is Maryland's official tall ship. This is a reproduction of a Baltimore clipper, a top-sail schooner best known as a privateer. Long, lean, fast, the most famous Baltimore clipper, Chasseur, gained fame (or infamy) when it raided English merchant fleet off the British Isles coastal waters during the 1812 war. 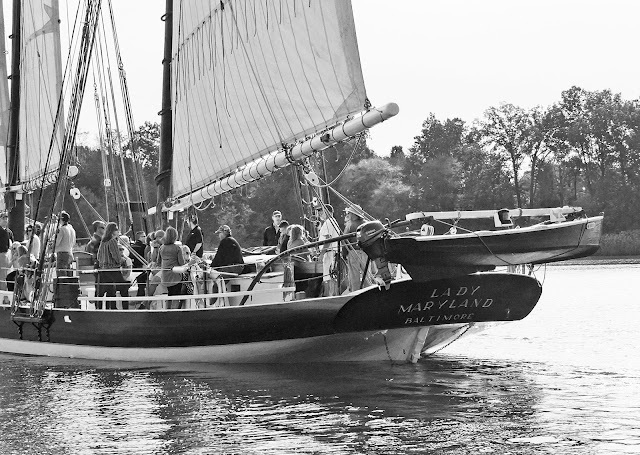 Lady Maryland is a reproduction of a pungy schooner designed for fast transport of perishable goods from the farms of the Eastern shore and lower Neck to the city of Baltimore. The heyday of this type was short, being built from the 1840's to about the 1880's. Lady Maryland is one of the older reproductions, being built in 1985. The stern on Lady Maryland is very pretty; upswept lines meeting a transom with curved topside. The boat on the davits looked to be a traditional Chesapeake Bay small working skiff. The A.J. Meerwald is a New Jersey oystering schooner. She is the original, built in 1928 and has been New Jersey's official tall ship since 1998. The Chesapeake Bay's own oystering work boat, the skipjack. Back to the Classic Moths, John Z was able to complete the sale of his Mistral, Y2KBug. Here is the new owner getting sorted out. From the Earwigoagin archives, the Classic Moth fleet racing with Chestertown in the background. 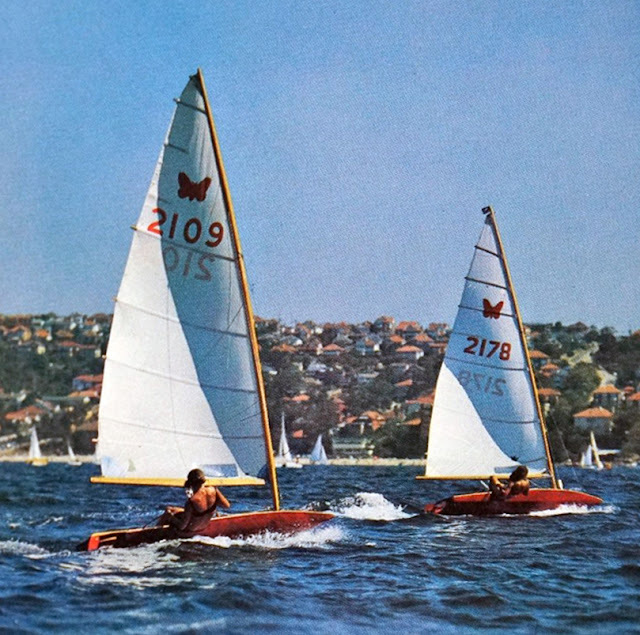 The Peter Cole cold-molded scow design was the top dog in the Australian Moth class in the 1960's (before wings). It was superseded by the double-chine, plywood Imperium design. Here is a dxf file of the Cole Super Moth (he pushed the centerline hollow very hard on this Super Moth). This design would make a good wood strip project for someone who wants a round-bilge scow Moth. 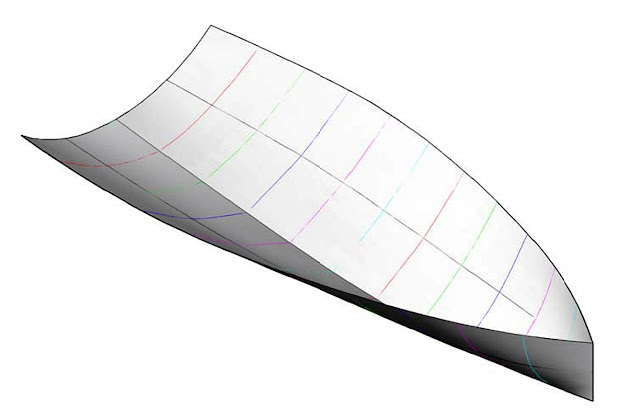 Dimensions in the dxf file are in meters. Station 1 - 76 mm. Station 2 - 304 mm. Station 3 - 608 mm. Station 4 - 912 mm. Station 5 - 1216 mm. Station 6 - 1520 mm. Station 7 - 1824 mm. Station 8 - 2128 mm. Station 9 - 2432 mm. Station 10 - 2736 mm. Station 11 - 3040 mm. Station 12 - 3333 mm. To print or download, use the "open in a new tab" button (the one with the arrow) in the top-right corner of window below. 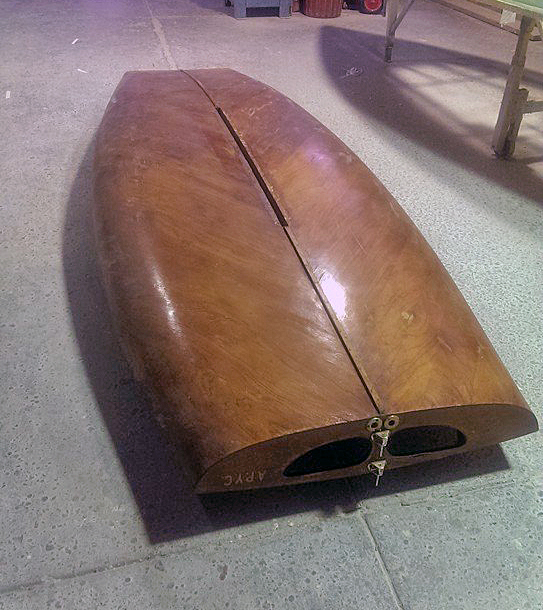 Two photos of the Cole Mouldie scow taken in Jim French's boat shop. The hulls were painstakingly molded out of 1/32" veneer and thousands of staples. A vintage photo of two red Mouldies at play. Tom Price sent this image along. The period swimsuit suggests maybe a 1920's time frame. He said he got it from a French website but can't remember where. 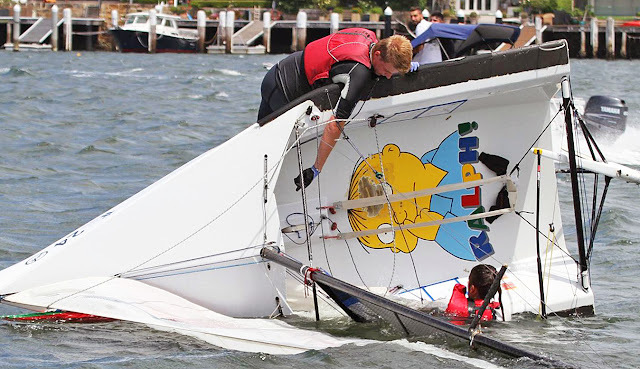 For the previous header photo I remained with an Antipodean theme (they are, after all, the ones sailing during the Northern winter) The photo was of a modern Australian Cherub dinghy losing it on a spinnaker reach during this years Australian Cherub Nationals. The Earwigoagin archives feature several post about this blasting machine. Unfortunately the class split internationally about ten years ago with the English deciding the make their Cherub class a mini-International 14 with two trapezes, narrow waterline and a much larger rig. Other Earwigoagin posts about the Cherub. A precursor photo shot just seconds before the completed layover of the header photo. A nice shot of the clean open interiors of the modern Cherub. I always like the dinghies that inject some color into the fleet. A leeward mark rounding and hardening up. 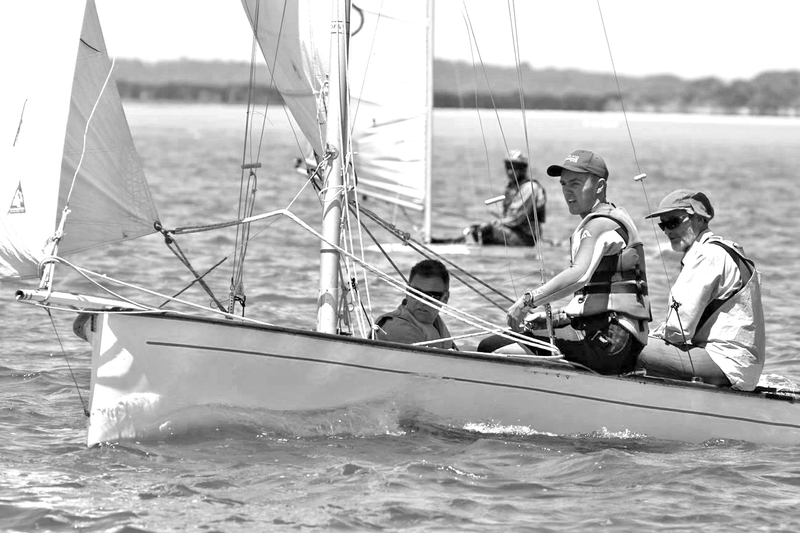 A superb video from this year's Australian Cherub Nationals. Music Whenever: Outdoor Type "On My Mind"
This boppy song from the Australian band, Outdoor Type, is getting some air play on the local radio. For the young there is always the attraction of the constant excitement in a big city. When I first started dating my future wife she said she wanted to move to New York City. She never did. I was partially to blame and I think there is some deeper, hidden regret within her that she never had the chance. 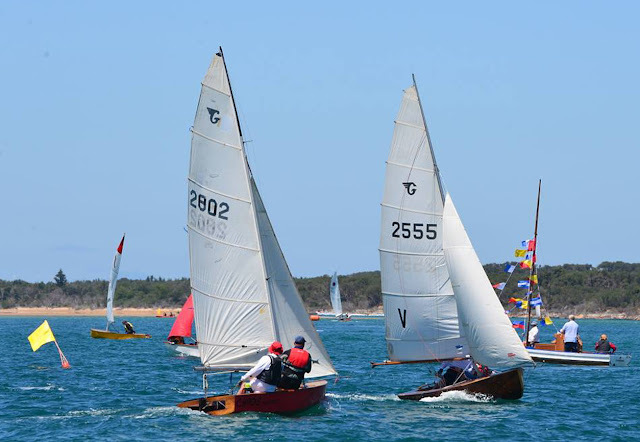 I covered the Australian Sailfish class at the Inverloch 2017 Classic Wooden Dinghy Regatta and this is the second post of that regatta to cover some of the other vintage dinghy classes that made an appearance. Attendance was close to fifty dinghies which was a record for this, still young, event. 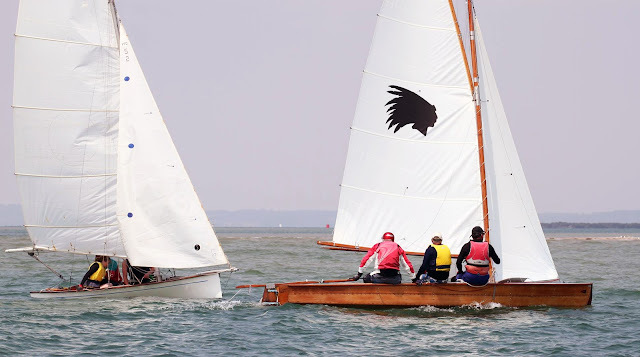 Many of these dinghies were also featured in photos from previous Classic Wooden Dinghy Regattas. 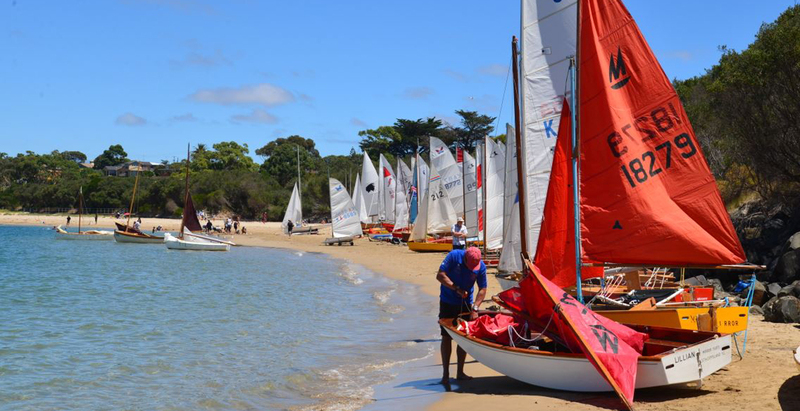 A nice shot of the Classic dinghies on the beach. A scow Moth and and yellow-sailed Impulse are in the foreground. The blue and white sail is an Australian Sailfish. Another beach shot with the Mirror dinghies and their distinctive red sails to the fore. 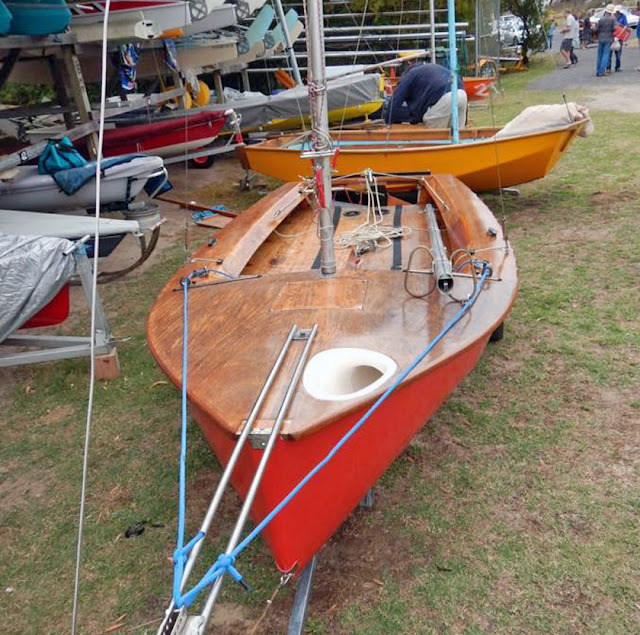 Australian scow Moth number 3130 is a Cole mouldie (wingless) design from the 1960's. 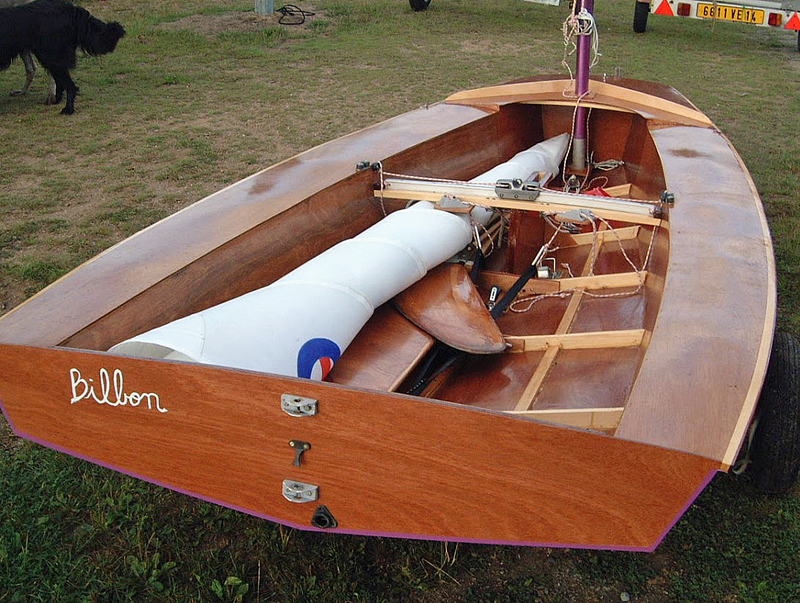 This scow was painstakingly restored by Phil Johnson who had to reglue many of the veneers. This is an Aquanaut class dinghy sailed by Graeme Cox. 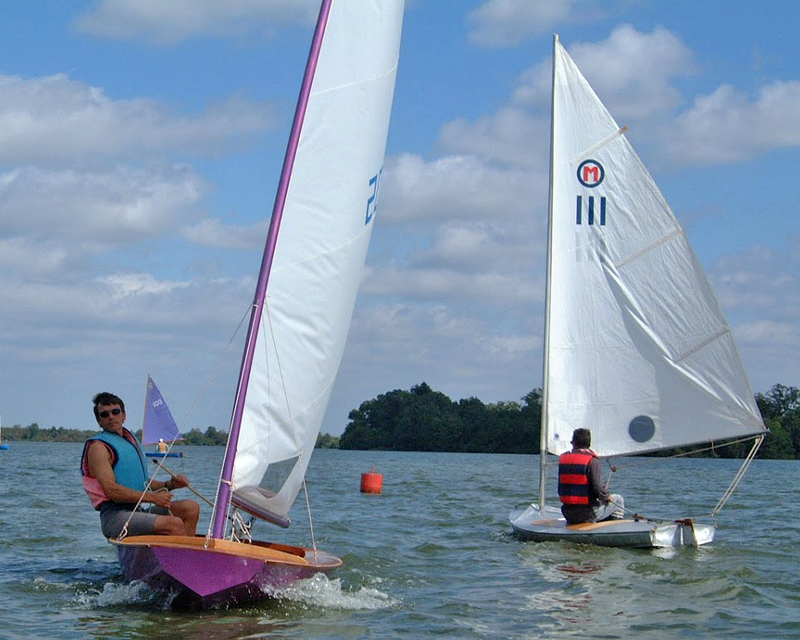 The dinghy is around the Mirror length, 10 feet, main and jib sporting a single-chine, plywood shape. (I think it was designed for stitch and glue.) Earwigoagin has posted about an aluminium Aquanuat. I'll see if I can find out more about this design. The beautiful cold-molded Aussie 16-foot skiff. 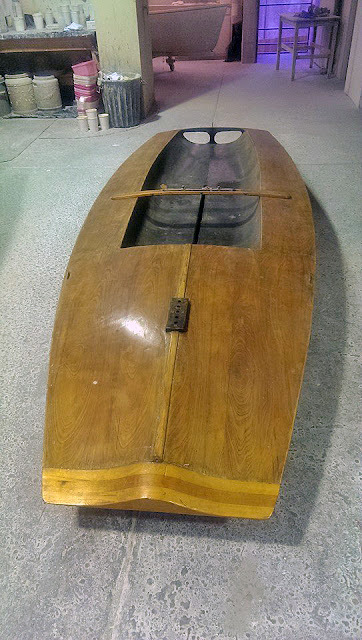 Owned by Frank Raisin, this skiff was professionally refurbished. This looks to be a double-bottom Gwen 12 (yet to be confirmed). Another winged Aussie scow Moth. Two of the larger three-man vintage dinghies crossing tacks; the cold-molded Aussie 16-foot skiff and the chined Olympic 12m2 Sharpie. 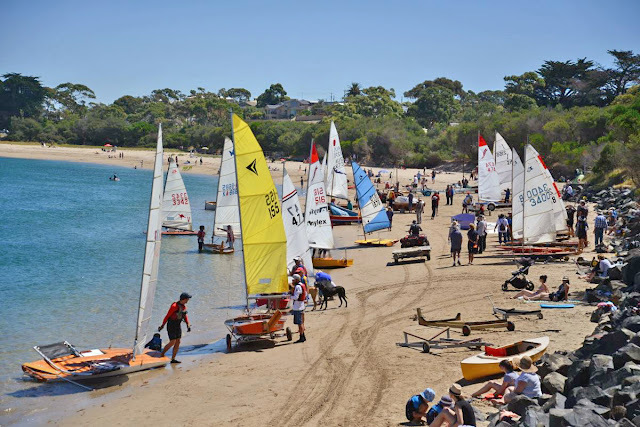 At the end of the racing, the dinghies transition from the beach to the "glade", a grassy area where spectators can look without getting their sandals gritty and the judges peruse for "Concours de elegance" awards. 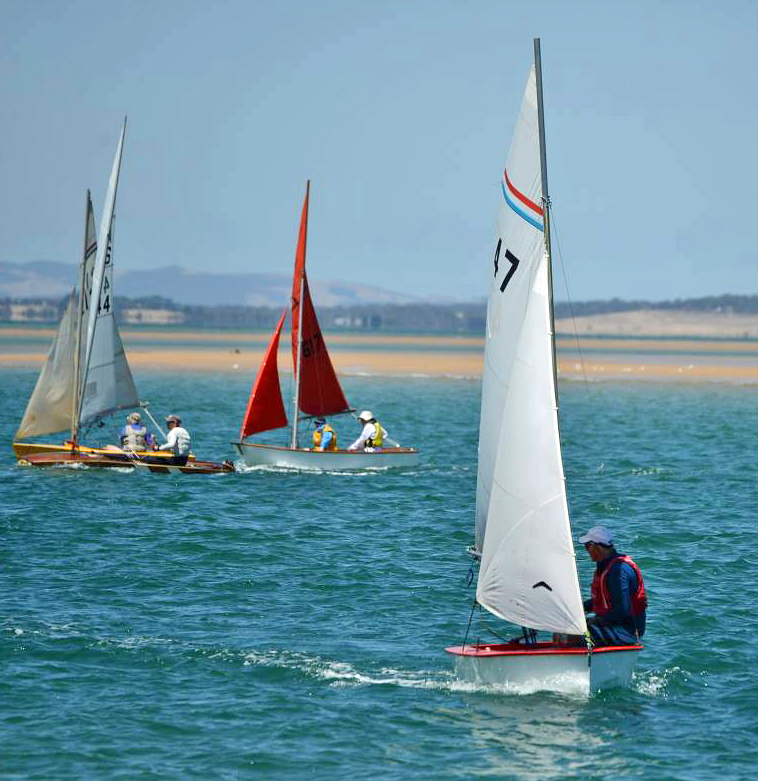 The Australian Classic Wooden Dinghy Regatta is hosted by the South Gippsland Y.C. Every winter I try to put together offsets of another Classic Moth. This is Bilbon, a design by Christophe Couton, which was the best of the new designs in the 2001 design competition sponsored by the magazine Le Chasse Marée. This Classic Moth design sports a pram bow and looks to be a stable design with it's wide beam. I've modified the design slightly to put a small curve in the bottom panels. The offsets are at the end of this post in a PDF file. 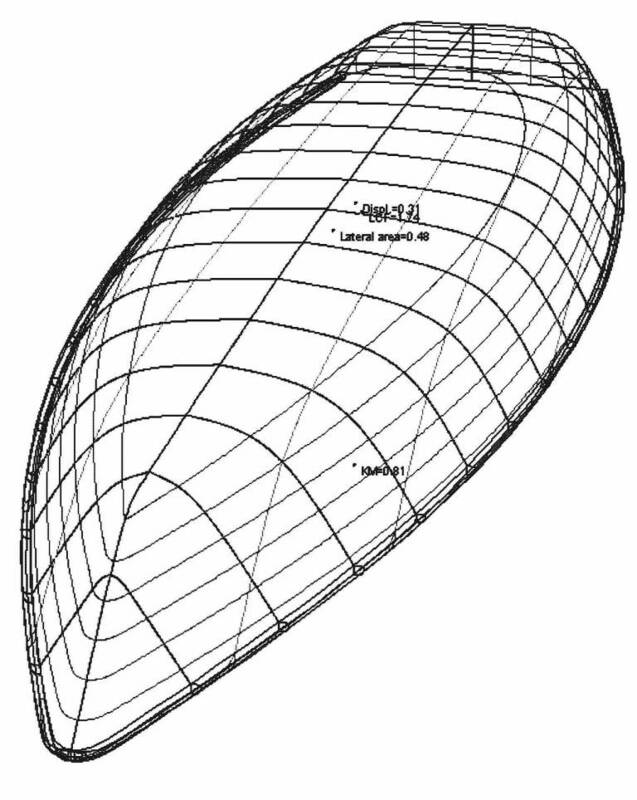 A very simple hull shape should make for a straightforward build. Bilbon sailing bow-on to the camera with the pram bow featuring prominently. 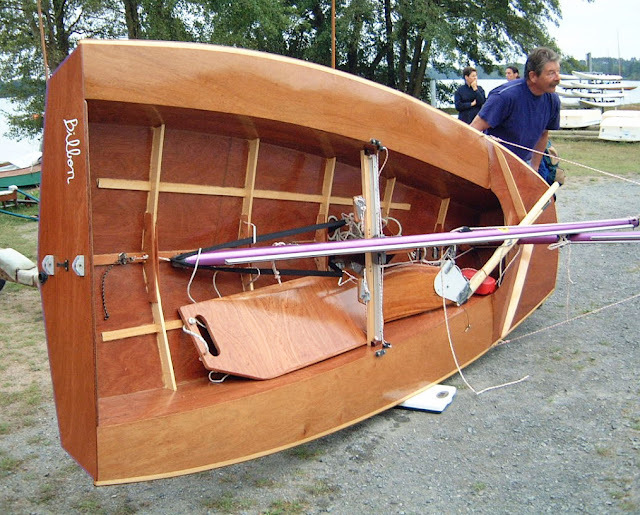 Chrisophe modeled this design on the Herbulot Caravelle design which also features a pram bow, but is a larger, main and jib dinghy which is popular in France. I like Bilbon's purple paint scheme. Moth no. 111 is the all aluminum Gouget design. Looks like Christophe used simple pine frames sistered together on the centerline. 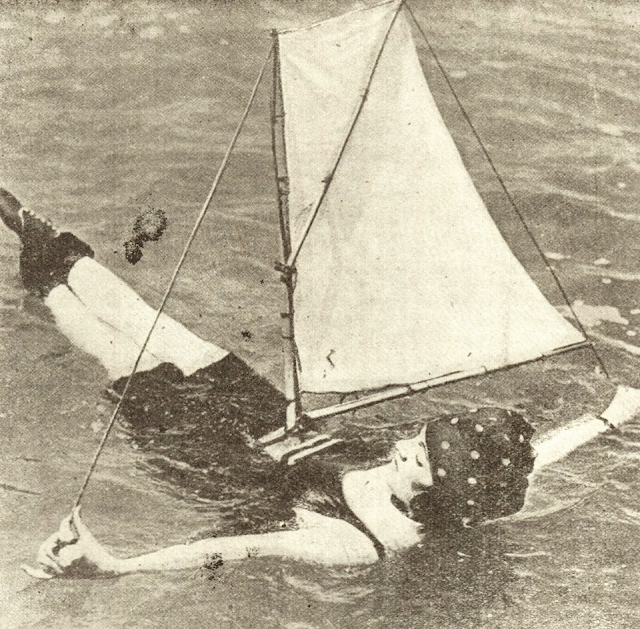 A center traveller controls the mainsail and the mast is stepped on the keel. Another view of the interior. Use the arrow icon on the top right to put this PDF of the offsets into another tab for printing.